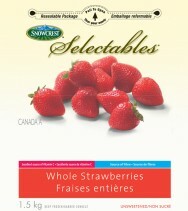 Whole Strawberries - 1.5 kg - Snowcrest Foods Ltd.
Snowcrest™ Selectables® Whole Strawberries are always as fresh as they are the day they were handpicked. Our whole strawberries are harvested when fully ripe and sweet. Each strawberry is delicately picked, washed and flash frozen within hours of harvesting, allowing it to retain its just-picked flavour all year round. These delicious whole strawberries are perfect for milkshakes and smoothies or as a topping on yogurt, cereal and ice cream. Serve them slightly thawed on their own as a snack, or try Snowcrest™ Selectables® Whole Strawberries in a Strawberry Cobbler. Strawberry is low in calories and fats but a rich source of many health promoting phyto-nutrients, minerals and vitamins that are essential for optimum health. Strawberries have significantly high amounts of phenolic flavonoid phyto-chemicals called anthocyanins and ellagic acid. Scientific studies show that consumption of strawberries may have potential health benefits against cancer, aging, inflammation and neurological diseases. Strawberries are an excellent source of vitamin-C, which is also a powerful natural antioxidant. Consumption of fruits rich in vitamin C helps body develop resistance against infectious agents, counter inflammation and scavenge harmful free radicals. The fruit is rich in the B-complex group of vitamins. 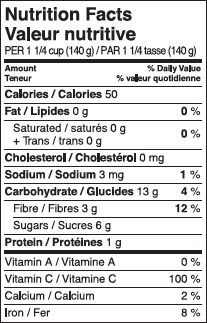 It contains very good amounts of vitamin-B6, niacin, riboflavin, pantothenic acid and folic acid. These vitamins, acting as co-factors, help the body metabolize carbohydrates, proteins and fats. Strawberries contain vitamin A, vitamin E and many health promoting flavonoid poly phenolic antioxidants such as lutein, zeaxanthin, beta carotene in small amounts. These compounds help act as protective scavengers against oxygen-derived free radicals and reactive oxygen species (ROS) that play a role in aging and various disease processes. They contain good amount of minerals like potassium, manganese, fluorine, copper, iron and iodine. Potassium in an important component of cell and body fluids that helps control heart rate and blood pressure. Manganese is used by the body as a co-factor for the antioxidant enzyme superoxide dismutase. Copper is required in the production of red blood cells. Iron is required for red blood cell formation. Fluoride is a component of bones and teeth and is important for prevention of dental cavities.